This operation involves removing skin and fat below the tummy button. At the same time the muscles beneath the tissue can be tightened up. This procedure can be combined with breast surgery for a mummy makeover and is performed on ladies once they have completed their family and at a steady weight. You will have a much flatter and more toned looking stomach area with a neat scar in the tummy button and a longer scar low down stretching from hip to hip. This is carefully designed to fit within your swimming garments or underwear. Karen* had disliked her stomach for a very long time. She had always had a good figure but had gained weight when pregnant and having children and found it very difficult to lose. Despite different diet plans and exercise regimes she had seen little. if any. improvement in her figure and became quite low in her mood and confidence. She had heard about a friend who had undergone surgery under my care and came to see me last year to discuss what could be done to improve things. Karen explained all she had done in order to improve her weight issue in terms of a good low calorie diet and weekly exercise classes and she confirmed that she was in good overall health and wasn’t smoking. Examining her I could see that she had a large amount of excess skin which was both above and below her belly button. I explained that the only way that this could be corrected was to have what is known as a full tummy tuck (abdominoplasty). I explained that this would need to be done while she was asleep (otherwise known as a General Anaesthetic). At this consultation, I also drew the site and length of the scar. This has to be individually tailored to the patient’s pattern of skin excess -with some people only needing a central scar but others needing the scar to come out over the hips. I explained how a full tummy tuck helps to improve the waistline by tightening the underlying muscles and then trimming away the excess skin. I showed Karen how I carefully re-site the belly button and fix it down to the tummy wall to create an attractive and natural tummy button with the scar well hidden inside the tummy button. I always like to see my patients at least twice before any surgery as this gives them time to think through all of the information and decide if the surgery is the right thing for them. Karen came back 2 weeks later and was interested to know more about recovery and how long she would be in hospital. I explained that most patients have a one night stay and need to wear a pressure garment to help support the tummy while it is healing. She had also decided that she would like to have liposuction to some troublesome areas on the flanks and we agreed that this could be done safely at the same time. I explained how I do not use any drains in my abdominoplasty surgery but instead preserve a layer of fat that helps drain the fluid away combined with a special type of tissue glue. This really helps patients to make a comfortable recovery. Karen confirmed that she wanted the tummy tuck surgrey and a date was scheduled. I saw Karen in the morning to mark her up and take her pre op photos. Her surgery went very smoothly with removal of 12 inches of skin that weighed as much as 2 bags of sugar! The wounds were all closed neatly and before she woke up we applied the pressure garment as I do not want my patients to have to move too much during the initial post-op period. I saw her the next morning and she was making great progress. I like to get patients mobile on Day 1 after a Tummy Tuck as this reduces the risk of blood clots in the legs. I saw Karen 6 weeks later and all wounds were beautifully heeled and scars were settling well. She was overjoyed with the result and had got back to all normal activities but was still not lifting any heavy weights as I always advise patients to wait until the muscle repair is fully mended. Mr Lambe listened to my concerns and didn’t put any pressure on me to go ahead which I liked as it gave me time to think and I knew then that I could relax and feel safe under his care. I am absolutely delighted with the results and feel like a new woman! I was amazed to see him on The Real Housewives of Cheshire so I know have a celebrity surgeon who is also down to earth, honest and really skilled at what he does. Would highly recommend! 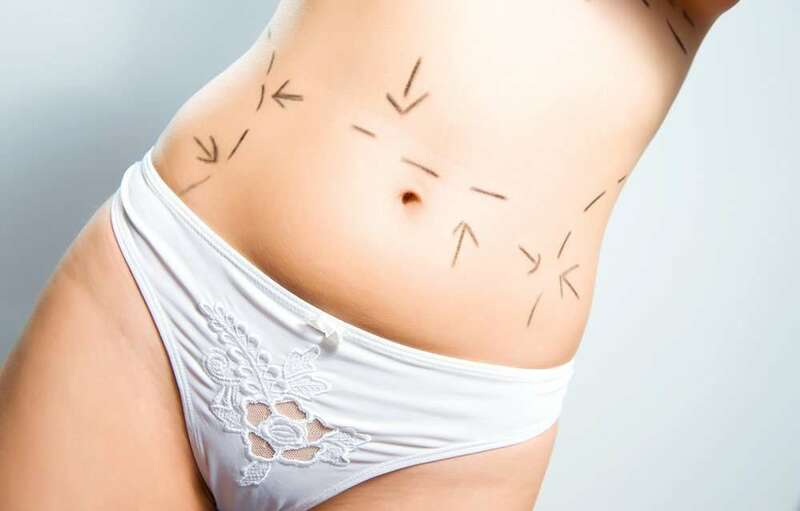 What is the price of a tummy tuck? All procedures at Reflect Clinic are unique to you. To find out a price for your tummy tuck please book a consultation and discuss your needs with our expert surgeon, Mr Gerard Lambe. A Tummy Tuck is the every day name for what Cosmetic Surgeons call an Abdominoplasty. This is an operation to remove excess skin around the tummy and can also be combined with Liposuction and tightening of the underlying tummy muscles to refine the result. and it is best to be at the weight you plan to stay when you have the surgery. The operation is done through a scar that runs from hip to hip but there are variations depending on whereabouts the excess skin is and so Mr Lambe will always draw the pattern of scar on you in the pre op clinic before you book for surgery so you can check that you are happy with it’s position. The scar can be varied to fit beneath clothes or depending on whether there is loose skin from side to side and not just in the lower tummy. Scars start off as pink and eventually fade to a thin silvery line over time. A Full Tummy Tuck lifts all the tummy right from the ribs and therefore allows the Surgeon to tighten the underlying muscles and to correct any laxity (loose skin) in the upper part of the tummy at the same time. This requires an incision around the umbilicus (tummy button) too. A Mini Tummy Tuck is for ladies who just have a small excess in the lower tummy area and this can therefore be removed with a smaller scar and without lifting the skin to the ribs. Recovery and complications are lower. It is therefore very important to have a detailed assessment to discuss all the pros and cons of each operation and which one is more suitable for you. The operation generally takes about 2-3 hrs depending on the extent of surgery needed. We do not use drains as a special layer is maintained beneath the tummy to drain fluid away (via the Lymphatics) and also by using a special tissue glue so you do not have to have uncomfortable removal of drains post op. You will generally need between 1 and 2 nights in hospital depending on how soon you can mobilise (move about). It is very important that you have someone to pick you up from the hospital after your surgery. What should I do post op? You should leave all dressings in place and keep the wounds clean and dry. You should always try to mobilise and this means each hour through the day doing 5-10 mins gentle walking. This helps you to recover and reduces the risk of post op clots in the legs. You will be provided with an abdominal support post op which you should wear for 6 weeks to improve the result and you will be provided with painkillers on discharge from the hospital. It is best that you take these on a regular basis as they work better that way. You will need 1 or 2 days of rest and then you must start walking and you may need to be bent at the waist for the first 2 weeks post op but you will be able to gradually straighten up. The final result will be apparent after 6 months as there can often be swelling in the lower tummy through the intervening weeks and throughout the day. There can be collections of fluid under the skin, known as seromas these often resolve with no treatment and because we use glue and preserve the lymphatics there is a very low incidence of this. Wound healing problems can happen. The part of the tummy that is tightest can sometimes take longer to heal. They are not common and by not smoking and taking care of your wounds this risk can be further reduced. What shouldn’t I do post surgery? You should not lift any heavy weights or young children for a period of 10 weeks post op in order that you do not undo any of the good work, so you will need help around the house and further support if you have young children.